A bit more about the cookbook from Wini: It's the result of a collaboration between French-born chef David Baruthio and me. (Chef Baru owns the widely acclaimed Baru 66 restaurant in Des Moines, Iowa). 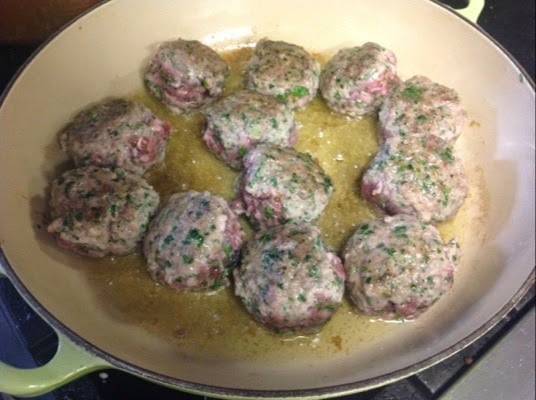 I just love the way this recipe shows that the French know their way around a meatball just as much as Italian-Americans do. Of course, we don't think of meatballs as something you'd braise, but in fact, on two different occasions, two different renown chefs (including David) have given me their recipes for meatballs, and both times they've been cooked partially submerged in liquid (not baked dry, as so many recipes call for). 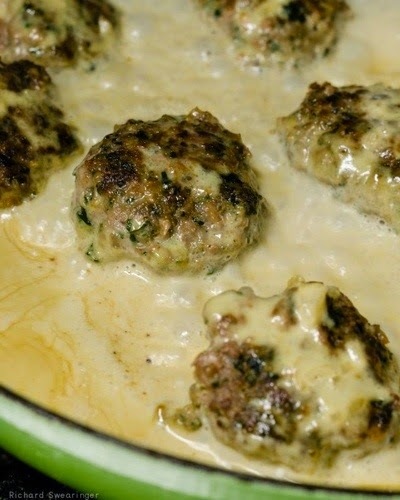 This method of cooking meatballs may just change your meatball-loving life! 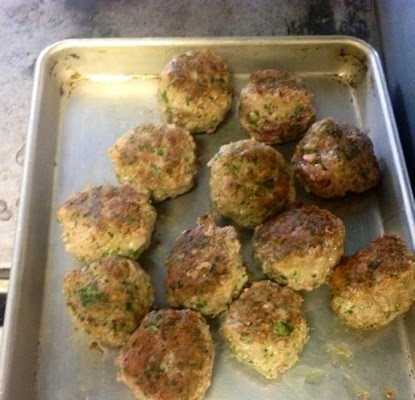 A word about the recipe: As you shape the meatballs, you're going to think they're super soft and too flimsy to fry. You're going to wonder where the breading is. There is no breading in this recipe; hence, what you get is pure, rich, meaty flavor, along with that fresh green spark of the parsley. The trick is to use lots of oil to keep them from sticking. Use a large tablespoon to gently turn them. And don't worry--you'll drain off most of that fat! P.S. A HUGE thanks to Wini for taking the step by step photos for me to share with the recipe! salty). 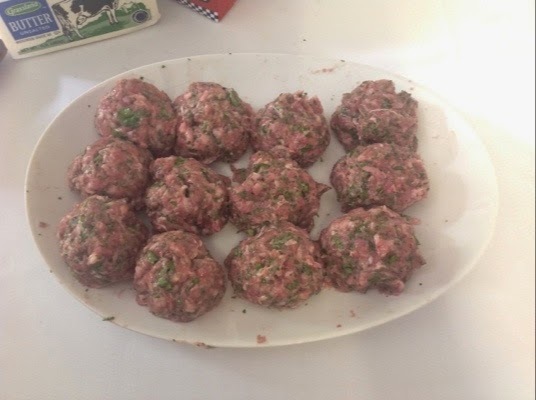 Shape the mixture into 12 meatballs. occasionally until nicely brown on all sides. Remove the meatballs from the pan. stir until the wine is reduced to 1/4 cup, about 3 minutes. Join the conversation on her Facebook page at Chez Bonne Femme. And if you live in Iowa, keep up with great food on the Des Moines dining scene on her local facebook page, All Things Food DSM - Wini Moranville. 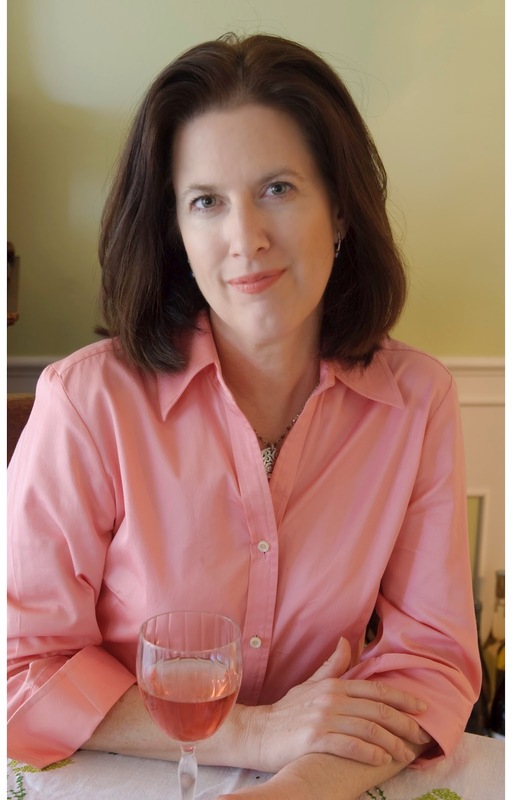 Wini is a food and wine writer whose work has appeared in many food and lifestyle magazines including Relish, Better Homes and Gardens, Country Home, Simply Perfect Italian, Holiday Appetizers, Holiday Celebrations, Holiday Menus, and Creative Home, Indulge Magazine, and DSM magazine. She has also served as a writer and editor for numerous cookbooks under the Better Homes and Gardens imprint, including three editions of the Better Homes and Gardens New Cook Book. From 1997 to 2012, she wrote over 750 restaurant reviews for The Des Moines Register. She currently writes occasional pieces about wine, food, and travel for this newspaper. In 2011, Harvard Common Press published Wini's book, “The Bonne Femme Cookbook: Simple, Splended Food That French Women Cook Every Day,” which has been featured in the Wine Enthusiast, the Chicago Tribune, the Boston Globe, The Minneapolis Star-Tribune, and numerous other newspapers, magazines, and blogs. 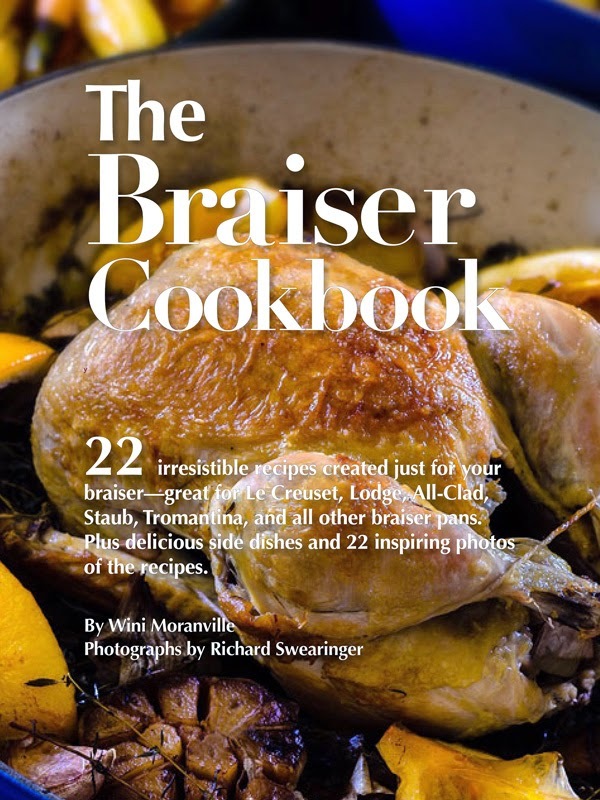 The book was named “Best Everyday French Cookbook” on National Public Radio’s shortlist of the best cookbooks of 2011. Since then, she has published two e-books: The Braiser Cookbook and The French Pasta Cookbook. *By the way, you can definitely make this recipe without a braising pan: See her post on How to Braise without a Braiser. 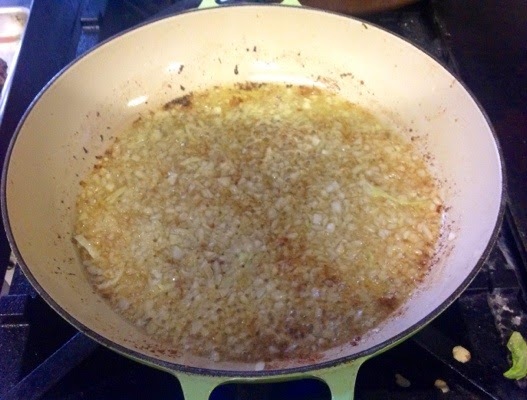 But if you're intrigued by the braiser, see her post on "What Is a Braiser? Should You Invest?" Great recipe from a great find in this mid-westerner's cookbook! What an absolutely perfect recipe for ground pork. I am loving everything about this dish. I want me some of those meatballs, they look delicious! Yum! What is it served with in the picture? It looks like sauerkraut? It is apples and cabbages. The recipe can be found in her e-cookbook. Your recipe look so yummy, can't wait to try it. Visiting from Pretty Pintastic Party! These look delicious! Thanks for sharing on The Weekend Social! OH MY! I could put that Dijon Cream Sauce on EVERYTHING. It sounds so yummy. Your meat balls sound delicious too. I absolutely love dijon cream sauce! I usually use it over chicken though. I LOVE your recipe! Pinning this to try soon! 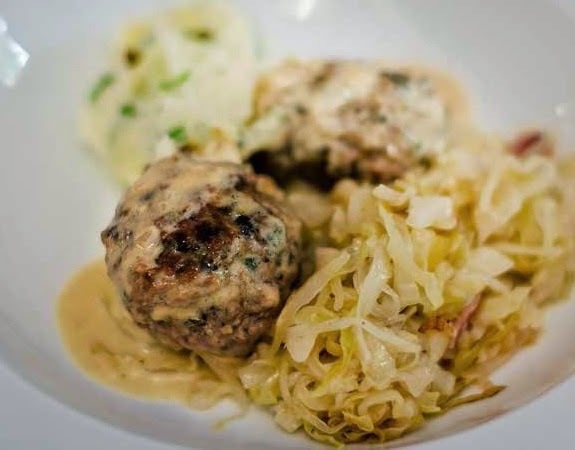 I will make this but I will bake the meatballs to make them with less fat.